I would like to see a small sewer system implemented for the largest cities in STN. I'm not sure if you plan to have large localized cities but if you do a sewer system would prove to be a tactical structure. Say you're scouting through buildings for items. You spot a group of bandits or a horde of zombies heading toward your location. You aren't quick enough to leave before they swarm the streets and you're trapped. You would have to wait and find an ample time to leave else you risk death. Though if their was a manhole to use you could hide in it or follow the tunnels to a different location with a better chance of escaping. You could also use it for a storage of items you might use later. Dropping a waterproof bag in the sludge to hide it's location or behind a removable brick in a specific wall. Of course they would need to be cramped and pitch black tunnels so only the prepared and willing could traverse them. A good suggestion, I think specialized tools or objects that could work like them is a good idea. 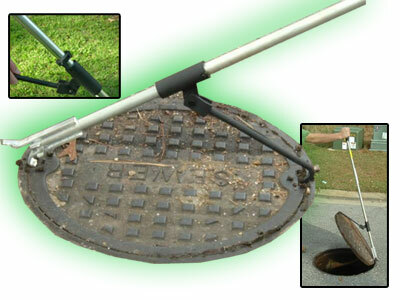 After all manholes are quite heavy (100lbs/50kg on average) and there isn't much room to get a grip on them. not as much as a crowbar more of a specific tool like @Bchhog said they can way up to 100lbs/50kg if you can lift that much weight with a crowbar as your running from zombies i would be surprised. Well from what I can see it has a better handle to grip with. Also it seems to be longer which to me would seem to lessen the effort needed to lift the cover. Not saying you couldn't do it with a crowbar, though it would take longer and require more effort. Road manhole cover tools are indeed a t shape key. The above are for pedestrian covers. ya i think that would be cool, it takes 5 seconds to open with a crow bar and 2 seconds to open with the tool. That would open up what sewer you could open dependant on your key... Rarer key = rare loot manhole? The idea of having different manholes and tools sounds good to me as well. I like the idea! Not super cramped but make it dark. With a little bit of light that shines through each manhole entrance/exit. its a somewhat safe way to get from point A to point B. I just got an awesome idea. If you can master the tunnels you could start a little business. They give you something you need and you guide them safely through the tunnels. Maybe a few places down in the tunnels big enough to set up a small sleeping area?